King and Robinson (1987) proposed changes to the genus Eupatorium that would result in this species being moved to the genus Ageratina based on differences in chromosome number (Ageratina almost double that of Eupatorium) and the morphology of the pappus. This species would then be referred to as Ageratina altissima (L.) King & H.E. Robins. The pappus of members of Ageratina have lobes that taper to a fine point, while those of Eupatorium have blunt lobes. Schmidt and Schilling (2000) looked at nucleotide sequence variation of nuclear ribosomal DNA sequences among 36 species of Eupatorium. Based on their results, they conclude that the retention of Ageratina in Eupatorium would require the inclusion of several other genera including Liatris for the genus to be monophyletic. Although I am keeping this species here out of convenience, I am inclined to agree with this name change. King and Robinson (1970) also proposed placing some species of Eupatorium in the genus Eupatoriadelphus, including E. maculatum and E. purpureum, based in part on leaf arrangement, where plants in Eupatoriadelphus have leaves in whorls of 3-7 that are at least 2 cm wide instead of opposite pairs. Based on the phylogeny of Schmidt and Schilling (2000), Eupatoriadelphus is sister to Eupatorium so splitting them seems arbitrary, although they recommend doing so. Common in woods, increasing with disturbance. Also moist calcareous shaded locations, rocky woods. All of the continental US east of the Rockies. 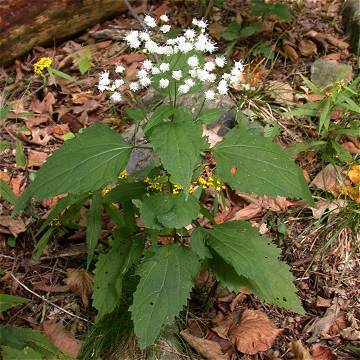 The name snakeroot comes from the use of the root as a remedy for snakebite by Native Americans. This plant was responsible for the mysterious "milk sickness" that plagued settlers in the 19th century, caused by ingesting the milk of cattle who have grazed on the plant. There is a purple-leaved cultivar of this plant called 'Chocolate' that is quite interesting. King, R. M., and H. Robinson. 1970 Studies in the Eupatorieae (Compositae). XXV. A new genus Eupatoriadelphus. Phytologia 19: 431�2. Schmidt, G.J. and E.E. Schilling. 2000. Phylogeny and biogeography of Eupatorium (Asteraceae: Eupatorieae) based on nuclear ITS sequence data. American Journal of Botany 87: 716�6.